As many of you know, Allegany State Park has some beautiful hiking trails. 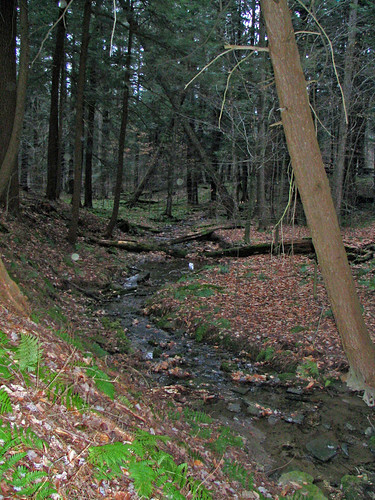 About 20 miles of trail through the park is also part of the Finger Lakes Trail (FLT), and coincides with the Conservation and North Country trails. 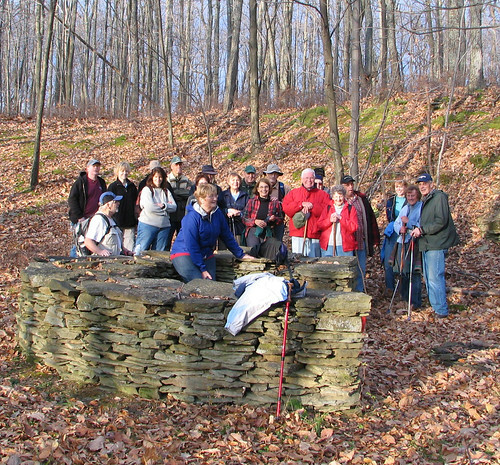 Recently a combined group of 23 from the Olean Area Hiking Group and the Allegheny Outdoor Club met to hike the portion that begins in the Allegheny National Forest near the Willow Bay Recreation Area on PA Route 346. Starting at an elevation of 1370′, the trail climbs steadily for about 2 miles to an elevation of about 1700′ (elevations from the FLT map). About 1.1 miles in the trail crosses from PA to NY and enters Allegany State Park. The trail is marked with white blazes and part of the trail also has red marks that have been added above and/or below the white blazes. The red marks are new over the past 6 months and it was uncertain who had added these marks. 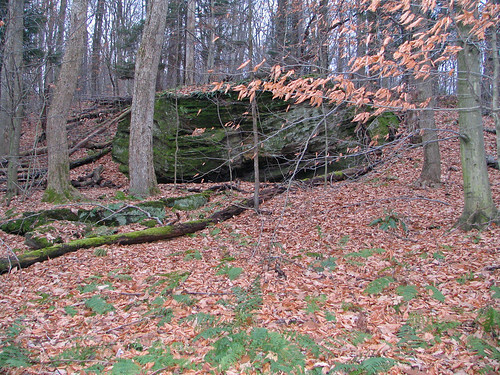 At one point the red marks veer off the main trail and go to the stone structure shown in one of the attached pictures. This shuttle hike, of about 4 miles, veered from the FLT by taking Brown Hollow Road to the Wolf Run area of the park. The section of the trail along Brown Hollow looked down on a babbling brook whose sound was drowned out by the constant sloshing of many feet through the deep carpet of fallen leaves. 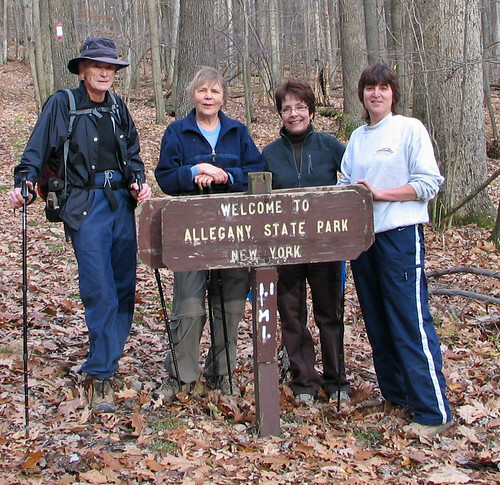 The following weekend my family hiked the other end of the FLT in Allegany State Park. The trail starts off of exit 19 (Red House Lake exit) on Bay State Road. This too is a beautiful trail. The trail climbs fairly steadily from 1440’ to 2060’ over about a 2 mile stretch, including switchbacks. There are glimpses of the Allegheny River to the west and some nice rock formations along the way. After the climb, the trail is then mostly flat or downhill to the Beck Hollow Lean-to built by the FLTC Alley Cat Trail Crew in 1998. The total hike, out to the lean-to and back, is about 5 miles. Find the dog in this picture? This entry was posted on 15 December 2011 by patacoate. 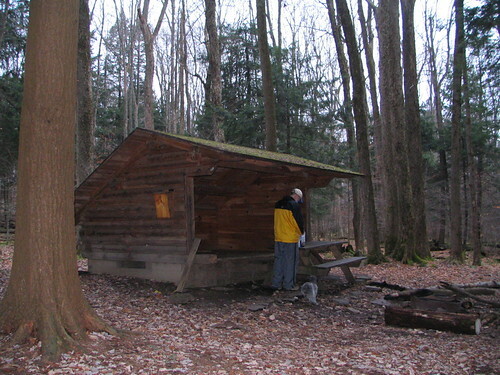 It was filed under iPhone and was tagged with Allegany State Park, Finger Lakes Trail. Ahhhhhh- there’s my trail! 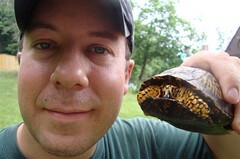 May I link to your post and use a quote on northcountrytrailnews.blogspot.com? Sure. We really enjoy all 20 miles of the North Country trail that passes through Allegany State Park. Thanks for reading and your comments! 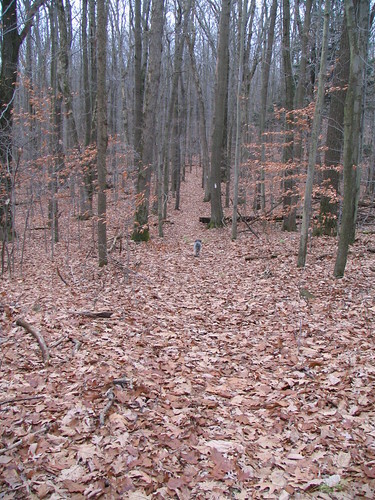 That looks like a absolutely wonderful trail, to bad im out in Michigan. The coolest thing we have is the sleeping bear dunes! The cold weather is making me miss going hiking! This looks like a really nice trail. Great photos, too! Lovely pictures! That is﻿ a great trail. great hiking experience.